The NVIDIA SMP (simultaneous multi-projection) Assist NVAPI driver extension is a simple method for integrating Multi-Res Shading and Lens-Matched Shading into a VR application. It encapsulates a notable amount of state setup and API calls into a simplified API, thereby substantially reducing the complexity of integrating NVIDIA VRWorks into an application. Specifically, the SMP Assist driver handles creating and managing fast geometry shaders, viewport state, and scissor state in lieu of managing these states manually in the application. In VR headsets, users typically view the display through lenses which introduce a pincushion distortion. VR Applications render a barrel distorted image to reverse the pincushion distortion of the lens itself, resulting in a geometrically correct scene in the headset. The peripheral areas of a barrel distorted image are shrunk significantly. 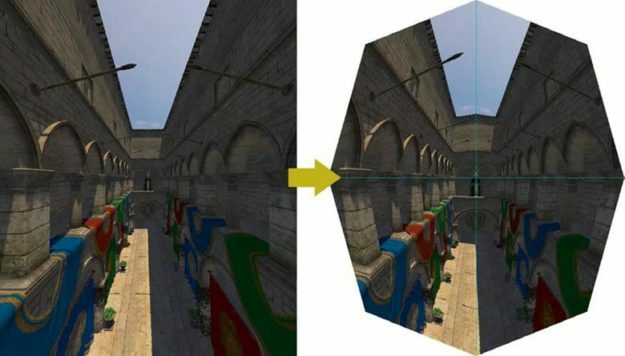 The NVIDIA VRWorks SDK includes features such as Multi-Resolution Shading and Lens Matched Shading, which allow application developers to take advantage of the non linearity in a barrel distorted image and reduce the pixel shading workload required to render a frame while maintaining visual quality. 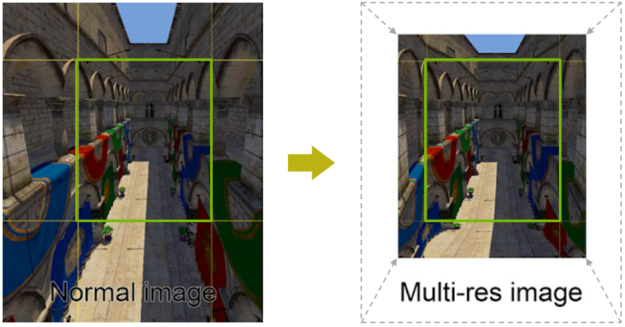 Multi-Resolution Shading (MRS), shown in figure 1, uses multiple viewports combined with scissor rectangles to create a multi-resolution projection. The resolution inside each viewport stays constant while the resolution varies across the different viewports. They can be arranged in such a way that the viewports together will represent one complex, seamless projection of the scene. The center viewport will typically have higher resolution than the peripheral viewports, thus better matching the barrel distorted image and saving unnecessary pixel shading workload. Conceptually, this scales the “w” coordinate of the vertices in clip space before the perspective projection. The clip space “w” coordinate of the vertices may be offset as a function of “x” and “y” coordinates, which results in vertices getting “pulled” towards the center of the viewport, the larger their “x” and “y” coordinates are. Carefully selecting coefficients A and B for each of the four quadrants of the frame produces a warped image which resembles barrel distortion. Each of these features requires the application to compute multiple viewports and scissors based on the desired effect. Additionally, for Lens Matched Shading, the application has to specify coefficients (A and B in the equation above). The application must ensure that the scene geometry renders correctly by setting a Fast Geometry Shader (FastGS) in the graphics pipeline. This shader culls triangles and broadcasts them to the correct viewport by computing the viewport mask. 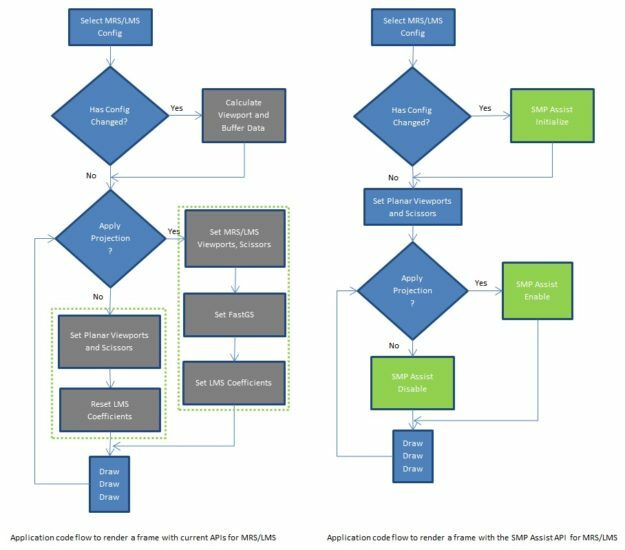 The new NVIDIA SMP Assist API implements all these steps in the driver and exposes a simplified API to the application, enabling easier integration of MRS and LMS into an application or a game engine. Create a FastGS which culls and projects primitives into the correct viewport, matching constant buffer data required for shaders that need to transform between projected and unprojected coordinate spaces. Compute Lens Matched Shading coefficients, if applicable. The driver computes and maintains the above state for various rendering modes – Mono, Stereo, Instanced Stereo. (The computations for Stereo and Instanced stereo rendering modes assume that the application is rendering in a side-by-side configuration i.e. both eye views rendered on a single rendertarget). Partial: The application specifies the configuration by providing the individual configuration parameters, which can be useful to support new or pre-production VR HMDs. Minimal: Application provides the viewports and scissors and the API handles the correct setting of the same while the application is responsible for setting a FastGS, GS constant buffer, and LMS coefficients. Using SMP Assist is straightforward. The application calls into the API whenever the MRS/LMS projection configuration changes, which should happen once per frame at most. The application then enables SMP Assist for those parts of the frame that requires applying MRS/LMS projection. On subsequent draw calls, the driver selects and sets the appropriate version of the state described in 1, 2, and 3 above, thus overriding viewports and scissors set by the application. The driver reverts any state it overrode to the original state when disabling SMP Assist and the following draw calls use the state set via the regular DirectX API. The API also provides functionality to get the internally computed data. This data could be useful for upscaling the image rendered via MRS/LMS. 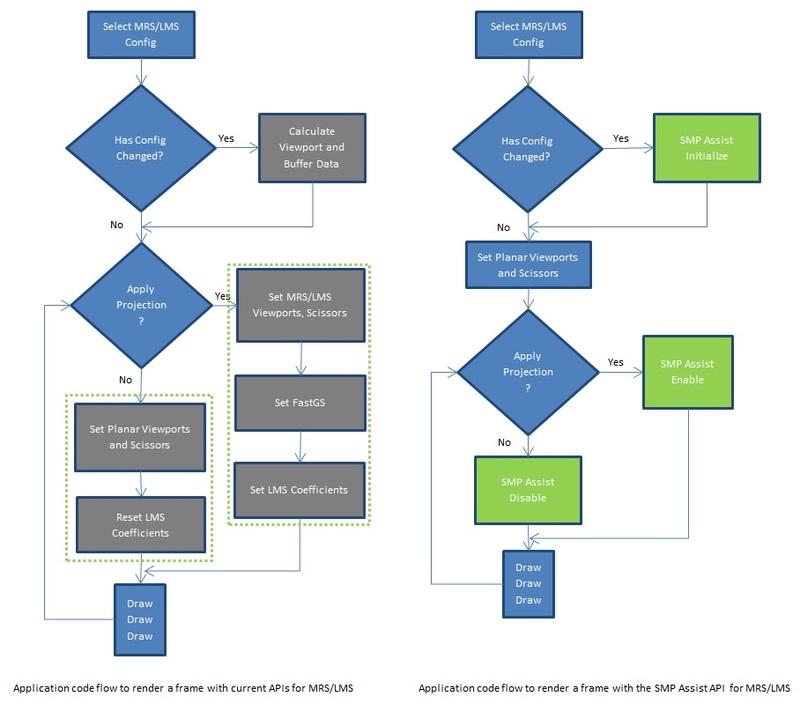 You initialize the SMP Assist API by querying for platform support for the desired SMP feature (MRS/LMS), obtaining a pointer to the SMP Assist interface, and using this interface pointer to specify the desired configuration (rendertarget size, etc). The SMP Assist interface object returned by NvAPI_D3D_InitializeSMPAssist is a singleton. Any subsequent calls to NvAPI_D3D_InitializeSMPAssist return a pointer to the same object. The object is created by the driver in response to the first NvAPI_D3D_InitializeSMPAssist call by the application. The driver destroys the object when the application exits. The application should not attempt to destroy the object. Applications call ID3DNvSMPAssist::GetConstants to read the data computed by the API during initialization. This includes viewports/scissors for the specified VR rendering mode, FastGS constant buffer data, projection size, and constant buffer data that could be used for the flattening pass among other things. The FastGS set by the driver needs to know whether the current shader instance is rendering the left or the right eye when the application renders in instanced stereo mode. The VR application must ensure world space shaders (Vertex/Hull/Domain) pass the current eye view (eyeIndex) correctly to the FastGS. The application should also create the last world space shader (Vertex/Domain) via NvAPI_D3D11_CreateVertexShaderEx / NvAPI_D3D11_CreateDomainShaderEx and indicate the eye index variable is a NvAPI_Packed_Eye_Index custom semantic. SMP Assist requires the eye index variable be a scalar. Set the LSB of eyeIndex to 0 if you want FastGS to render the current instance to the left eye. Otherwise, FastGS will render to the right eye. Instanced stereo rendering involves shifting vertices according to the eye-view being rendered in the current shader instance. However, LMS requires that the application not perform such vertex shifting. This means the application might have to modify the vertex shader to ensure that the vertices are not shifted in case of LMS. SMP Assist provides an API, UpdateInstancedStereoData, which can be used to undo shifting of vertices performed by the application’s shader code. The application need not modify the shader code for the LMS specific requirement described above. The application simply has to provide the correct coefficients to this API. These coefficients will be used to implement the equation to reverse the vertex shifting done by the application’s shader code. The equations for the left/right eye view’s x component can be viewed as a dot product between vertex position and a vector of size 4. The equation implemented by SMP Assist takes in 5 values per eye-view: 4 coefficients for the dot product with the vertex position and a 5th value to add to the result of the dot product. The SMP Assist API built into NVIDIA drivers enable developers to more easily implement multi-resolution shading and lens-matched shading, key features which make virtual reality more accessilble and user-friendly. If you’re not currently an NVIDIA developer and want to check out VRWorks, signing up is easy — just click on the “join” button at the top of the main NVIDIA Developer Page. SMP Assist API requires NVIDIA graphics driver version 397.31 and above. The latest VRWorks Graphics SDK 2.6 release includes a sample application and programming guide which walks through SMP Assist if you already have an NVIDIA Developer account. Vishwesh Inamdar is a Senior Systems Software Engineer in NVIDIA’s Pune (India) Design Centre working on VRWorks Graphics. He has a Masters in Computer Science from the Indian Institute of Technology, Kanpur, India.